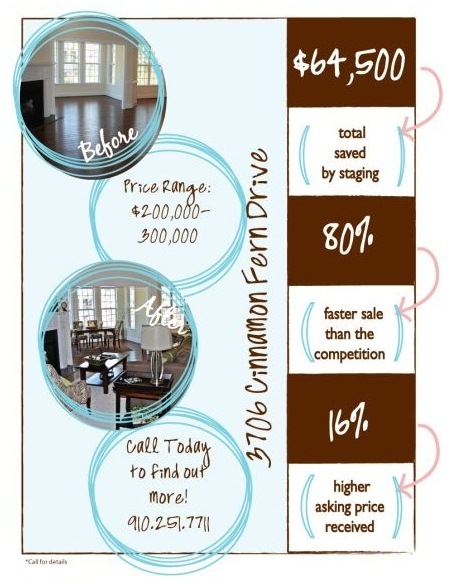 Another amazing set of statistics from Jessica Pirone and her 2012 RESA Home Staging Company of the Year, Just Perfect & more Home Staging. I love the way Just Perfect shows off the value of their services is this very classy marketing piece, perfectly branded and visually clear on the point. Notice, on this flyer, that while the savings are HUGE, the home price is moderate. Savings are calculated when comparing to other non-staged properties in that area, or time on the market prior to staging.